"They said a guy came in crazy with a hammer and started hammering people"
A 34-year-old man is being questioned about a violent hammer attack inside a Brooklyn buffet that killed a chef and wounded two others. Ida Siegal reports. A chef at a Brooklyn restaurant died after a man with a hammer burst into the business and attacked him and two others in what police say was a random attack. 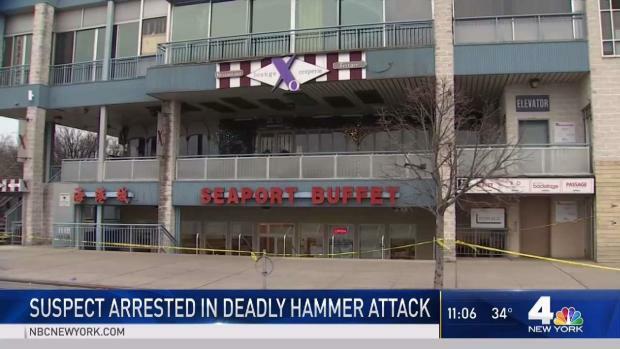 The hammer-wielding suspect burst into Seaport Buffet Tuesday evening, randomly attacking the 60-year-old owner, a 34-year-old chef and a 50-year-old worker, police said. The suspect, identified by police as 34-year-old Arthur Martunovich, walked into the buffet near Emmons Avenue and East 19th Street in Sheepshead Bay just after 5 p.m., first attacking the owner at the front of the restaurant, then going to the back where he hit the chef and worker, according to police. The suspect in a Tuesday night hammer attack at a Brooklyn restaurant that left the chef dead and two others injured has been arrested, law enforcement sources say. Katherine Creag reports. All three victims were taken to NYU Langone Hospital - Brooklyn in critical condition. That's where the chef, later identified as Fufai Pun of Brooklyn, was pronounced dead. Samantha Randazzo, the owner of Randazzo's Clam Bar next door, said a worker from the buffet came running in to warn them about the tool-wielding suspect. "A couple of people, customers from the restaurant, came in here, and we let them in and they said a guy came in crazy with a hammer and started hammering certain people, random people," Randazzo said. "The guy said he was just screaming crazy words, like, 'I'm killing everybody, world is hell,'" she said. "Just screaming crazy things." She said workers inside the clam bar locked their doors in fear. "We tried helping people who were trying to come in, customers, but we were scared to even walk out," she said. "We didn't know where he was." Witnesses say a quiet Brooklyn restaurant turned to chaos when a man with a hammer charged in attacking. Ray Villeda reports. Witnesses said they saw the suspect running toward a garage behind the restaurant. An officer arrested him a few blocks away. The motive behind the violent evening outburst was unclear. Martunovich, of Brooklyn, was arrested Wednesday on charges of murder, attempted murder and criminal possession of a weapon.